Black Gate is very pleased to offer an exclusive first look at the latest Pathfinder Tales novel by Dave Gross, the acclaimed author of Prince of Wolves, Master of Devils, and Queen of Thorns. After a century of imprisonment, demons have broken free of the wardstones surrounding the Worldwound. As fiends flood south into civilized lands, Count Varian Jeggare and his hellspawn bodyguard Radovan must search through the ruins of a fallen nation for the blasphemous text that opened the gate to the Abyss in the first place-and which might hold the key to closing it. In order to succeed, however, the heroes will need to join forces with pious crusaders, barbaric local warriors, and even one of the legendary god callers. It’s a race against time as the companions fight their way across a broken land, facing off against fiends, monsters, and a vampire intent on becoming the god of blood-but will unearthing the dangerous book save the world, or destroy it completely? From best-selling author Dave Gross comes a new adventure set against the backdrop of the Wrath of the Righteous Adventure Path in the award-winning world of the Pathfinder Roleplaying Game. Dave Gross is the former editor of Dragon, Star Wars Insider, and Amazing Stories. His adventures of Radovan and Count Jeggare include the Pathfinder Tales novels Prince of Wolves and Master of Devils, as well as many novellas and short stories available at Paizo.com. His last novel for Paizo was the acclaimed Queen of Thorns. We previously reviewed the Pathfinder Tales novels Death’s Heretic by James L. Sutter, Master of Devils by Dave Gross, and Howard Andrew Jones’s Plague of Shadows, and introduced you to BG Contributing Editor Bill Ward’s Pathfinder Tales story “The Box, and “The Walkers from the Crypt” by Howard Andrew Jones. We recently covered the game releases Ultimate Campaign, Fey Revisited, and Chronicles of the Righteous. 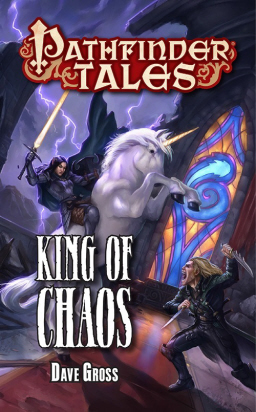 Pathfinder Tales: King of Chaos is published by Paizo Publishing and is part of their Pathfinder Tales Subscription. It is a 400-page mass market paperback available for $9.99 ($6.99 ePub and PDF). “The Watchtower,” the complete first chapter of King of Chaos, is presented here at Black Gate. Read Chapter One of King of Chaos here. Something i thought was pretty interesting, Ed Greenwood now has a pathfinder novel out called The Wizard’s Mask. I haven’t read the Wizard’s Mask but i have read a short story he wrote for the same universe called Guns of Alkenstar. I liked this story more than i thought i would. Ed’s one of the hardest-working writers in the business, and I don’t think he gets the recognition he deserves.